The saying goes that a picture is worth more than a thousand words, and nothing proves that more than this incredible image. 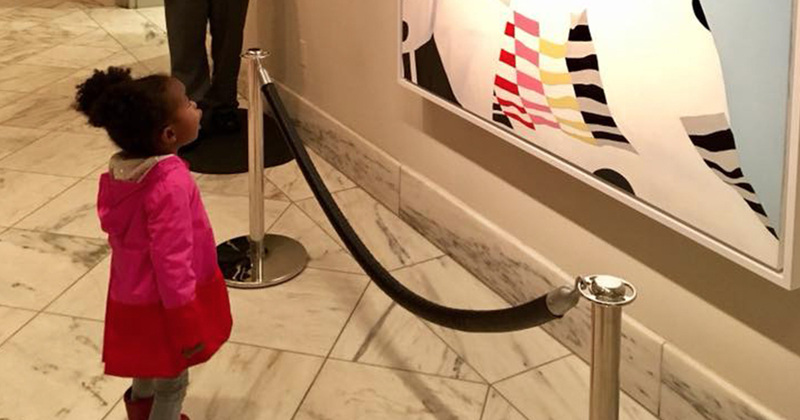 For anyone who says that representation in society doesn’t matter, just show them this image of a 2-year-old girl gazing up at a portrait of Michelle Obama. The image was posted to Facebook by Ben Hines, 37, from North Carolina, who captured the inspiring image. I think we were al just smiling, and her joy and her awe was infectious. The little girl, Parker Curry, was taken to the gallery on Thursday just to see the Obama portraits. Parker’s mum Jessica said she couldn’t get her daughter to turn from the Michelle portrait because she was so ‘fascinated’. As a little person looking at a portrait that large, I can imagine it’s fascinating. She had a little moment. I didn’t realise [the image] would be so moving to so many people. The image has even reached the artist who painted the portrait, Amy Sherald, who took to Instagram to voice her feelings on the situation. When I look at this picture I think back to my first field trip in elementary school to a museum. I had only seen paintings in encyclopedias up to that point in my life. There was a show up of work by painter @thebobartlett whose work still inspires me to this day. There was a painting of a black man standing in front of a house. I don’t remember a lot about my childhood, but I do have a few emotional memories etched into my mind forever and seeing that painting of a man that looked like he could be my father stopped me dead in my tracks. This was my first time seeing real paintings that weren’t in a book and also weren’t painted in another century. I didn’t realise that none of them had me in them until I saw that painting of Bo’s. I knew I wanted to be an artist already, but seeing that painting made me realise that I could. What dreams may come? The portrait was unveiled last month, along with the portrait of Barack Obama at the National Portrait Gallery in Washington, D.C. Speaking at the time, Michelle showed incredible prescience in thinking of the significance of the piece of art. [I am] thinking of all of the young people, particularly girls and girls of colour, who in years ahead will come to this place and they will look up and they will see an image of someone who looks like them hanging on the wall. I know the kind of impact that will have on their lives because I was one of those girls and, when I think about those future generations and generations past, I think, again, wow. Wow, what an incredible journey we are on together in this country. We have come so far. Wow. I’m not crying, you’re crying.